Kemei are honored and happy to serve you, offering you most professional beard care products bringing you well groomed beard. gentlemen's ultimate choice. When it comes to beard trimming, there is no compromise here in Kemei. We know it is not just a matter of appearance, but you gentlemen's attitude to the world. 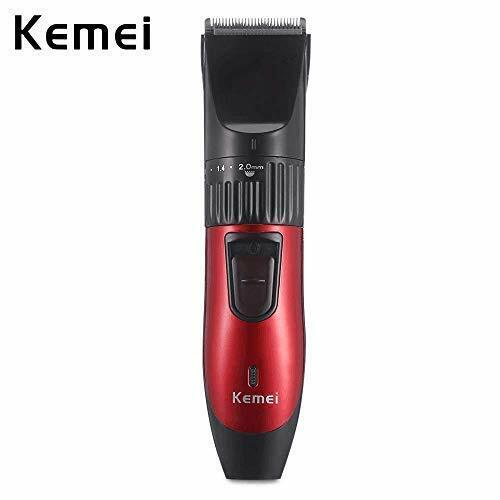 Kemei has applied its state-of-the art blade technology to the KM-730 Trimmer. The result is a precision blade of extraordinary strength and performance. And the outstanding edge you need for comfortable grooming. These precision men's trimmer blades are made from highest quality, hypoallergenic titanium alloy blades for strength, durability and irritation-free trimming on even the most sensitive skin. Maintain your perfect beard and mustache trim length with a quick-adjust dial. Choose precise electric trimmer settings from 0.8mm to 2mm for clean, even trimming, sculpting and detailing. 1. If clean it in water, just wash trimmer head rather than trimmer body. 2. The blade will get heat when it is running in high speed which is normal. 3. Better not share the beard trimmer with others.